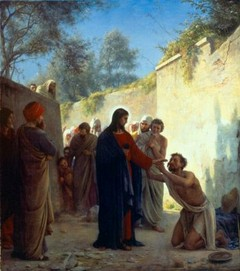 Jesus touches the leper and heals him. Here is a story from Jesuit Father Anthony de Mello’s book of fables, The Song of the Bird. When the bishop’s ship stopped at a remote Papuan island for a day, he determined to use the day as profitably as possible. He strolled along the seashore and came across three fishermen mending their nets. In pidgin English they explained to him that centuries before missionaries had come to their island and converted them to Christianity. “We, Christians!” they said, proudly pointing to themselves. The bishop was impressed. Did they know the Lord’s Prayer? They had never heard of it. The bishop was shocked. How could these men claim to be Christians when they did not know something as important as the Lord’s Prayer. “What do you say, then, when you pray?” the bishop asked. The bishop was appalled at the primitive, downright heretical nature of their prayer. So he spent the whole day teaching them to say the Lord’s Prayer. The fishermen were poor learners, but they gave it all they had and before the bishop sailed away he had the satisfaction of hearing them go through the whole formula without a fault. Months later the bishop’s ship happened to pass by those islands and the bishop, as he paced the deck saying his evening prayers, recalled with pleasure the fact that on that distant island were three fishermen who were now able to pray correctly, thanks to his patient efforts. While he was lost in thought he happened to look up and noticed a spot of light in the east. The light kept approaching the ship and, as the bishop gazed in wonder, he saw three figures walking on the surface of the water towards the boat. The captain stopped the boat and all the sailors leaned over the rails to see this amazing sight. “What is it you want?” asked the bishop in awe. If you get the truth of the story, you will have no trouble getting the point of this story of Jesus’ healing the leper, which is that we are – all of us, without exception – loved and touched by almighty God. Sunday 15th Feb. 6th Sunday of Year B. 1) Scripture Teachers in Primary Schools. 2) New Altar Servers for Weekend Masses. 2 bedroom unit for rent. Inquiries phone 60331564 or Parish 60331927. The theme for Lent is “Rich in Mercy”. Be sure to collect your Project Compassion boxes next Sunday and be generous to the “Food for Life” campaign with your daily sacrifices on behalf of the poor.